The day is indeed dark, cold and windy with rain coming down in California-sized buckets. My Black Friday became reality early this afternoon as I spritzed upon my naked neck and shoulders the beginning of the end of the last half-bottle of Nuit de Noël. I might not ever again have a chance to own this sublime fragrance. A bit of perfume history shall suffice for this funereal moment. 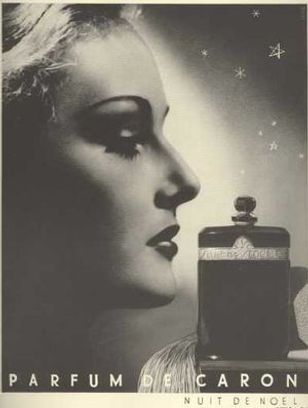 In THE DAWN, the mother of Camille used the Caron perfume named Nuit de Noël. 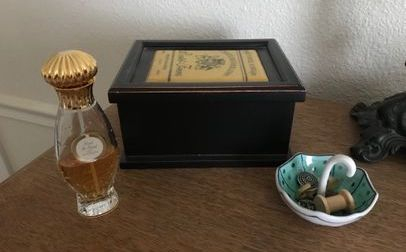 As I wrote this novel, in 2009, I decided to go along with the flow of my writing, in the sense of scent, and wear this Caron creation in the EdT formulation — starting on the day after Thanksgiving and ending on Christmas Eve. The routine thereafter became a sweet olfactory tradition for me. Purchasing the small bottle online had not been a problem. Back in the deepest days of the Great Recession, buying anything online was not a problem. In fact, Americans were exhorted to buybuybuybuybuy online, offline, anywhere, not just at holiday time, but all-year-round. Somehow, the nation was expected to get out of the recession the way it had gotten into it. Charge it!!!! I didn’t really have that future until after the birth of my first child, a boy, when I purchased my first perfume, Ombre Rose by Jean Charles Brosseau. I still wear this scent, lovingly, in the eau de toilette that, to me, has a softer allure. I think of Ombre Rose as the scent that sent me to my future. By the year 2000 I felt womanly enough to approach Chanel No. 5. I went to the upscale department store and gave it a whiff but felt indifferent about it. I then sniffed Coco and fell in love with it. I enthusiastically purchased the EdT which my skin seems to prefer to parfum in most fragrances. During the ensuring decade, I did not give a thought to purchasing any of the Fruit-Loop-Flower-Bomb-juices sold as perfumes to the younger masses that demanded womanhood by 20 or so. When I discovered Nuit de Noël, however, the sensation was worthy of narrative prose notation in the draft of my novel. It was a happy coincidence of a woman meeting an essence that was redolent of her past, her present, and her future. And now, it seems, there is no future for the House of Caron. Caron blew it. Big-time. Financial mismanagement and the slavish chase after those Niche Markets took their toll on a French perfume house that is 114 years old. Caron is experiencing “financial restructuring”. In plain English, it’s on the chopping block, for sale, to who knows? The hoarders of vintage perfumes are out in force. 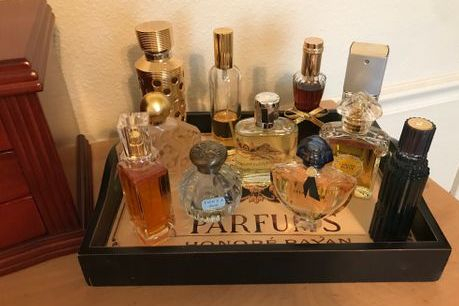 Exorbitantly overpriced counterfeit bottles of Nuit de Noël, probably filled with bug spray, now populate Evil Bay and other sites where scent-hounds sniff out those no-longer-available perfumes. In my Winter 2014 post on “The Discipline of Art,” I featured a photo of my perfume tray. In the rear section, there is the bottle of Caron’s Nuit de Noël that I have very sparingly used since that winter. When I realized sometime during the spring of 2016 that the perfume was no longer available, I decided to completely forego the winter scent tradition that year, and in 2017. This Christmas season, however, come what may, I intend to use up the balance of a classic, my classic. It may be that a company like Coty will buy Caron, and wreck it. François Coty is also featured in THE DAWN; his story alone could fill a book, and not of fiction! Maybe a snow-angel investor will decide that the company that created Nuit de Noël, along with Pour Un Homme, is worthy of rescue and rehabilitation. It’s been a long haul for Parisian businesses since the Fall of France. But, as we've seen: Miracles can happen!